Bitcoin Cash (EXANTE: Bitcoin.Cash) appeared as a result of the scalability problems inherent in Bitcoin (EXANTE: Bitcoin). The idea is that the more users are online and the more they make transactions, the slower the network works - a block of 1 MB is filled up faster than it is mined. As a result, transactions become slow and expensive. Bitcoin Cash works on the updated protocol, and the block size is 8 MB, which means that each block received by the miners can be used to process more transactions, and many believe that this is a step in the right direction. Many believe that this is only a temporary "patch", which does not fix the problem at the root and so they proposed the SegWit protocol, which now works in the initial branch of the Bitcoin blockchain and involves breaking up transactions into smaller and more manageable fragments. If you don’t feel like debating and just want to become the proud owner of Bitcoin Cash – this guide is for you. First of all you need a wallet in which you will store your purchased cryptocurrency. Many providers and platforms are unwilling to implement Bitcoin Cash, and each has its own reasons. As for the wallets, many of them already support Bitcoin Cash. There are not so many exchange options, but there are still enough. The most well-known hardware wallets Ledger and Trezor support Bitcoin Cash. They also implemented, albeit not immediately, the opportunity to get Bitcoin Cash, if at the time of the blockchain split you had bitcoins. There are a lot of software wallets with Bitcoin Cash support - perhaps you are using one already for Bitcoin. For example, Exodus provides an opportunity to convert one cryptocurrency into another right inside the wallet. Jaxx also supports several currencies, including Bitcoin Cash, and the service runs on both computers and mobile devices, and the private key can be kept with you all the time. Electron Cash is just a version of Electrum, so if you are used to the latter, you will not have any problems. There are certain exchanges that work with Bitcoin Cash. Yes, changing money at the same time is convenient, but you lose control over your private keys, which can be dangerous. A good wallet is offered by Coinfloor. They promise to keep your keys in an offline cold storage, making the funds available for trading in the application. Among other wallets there are Keepkey, BTC.com, Bitpay and Coinomi. All available options can be found on the official website bitcoincash.org. Exchanges operating with Bitcoin Cash are not as common as the ones supporting Bitcoin, some are engaged in other areas or have not yet seen its potential. Nevertheless, there are some decent options. Coinfloor supports the open exchange of Bitcoin Cash, and Kraken has been working with Bitcoin Cash since August, when the cryptocurrency was launched. Another good option is CEX.IO. This London-based company exists since 2013, and managed to earn a name and experience. There is a large selection of currencies, and Bitcoin Cash is one of them. If you just want to buy a certain currency, there is an option of a quick purchase using a credit card. Just keep in mind that the option with a credit card is quite expensive. To save money, you can make a deposit through a bank transfer, then the commission will be only 0.2% - in large transactions it can save a fortune. 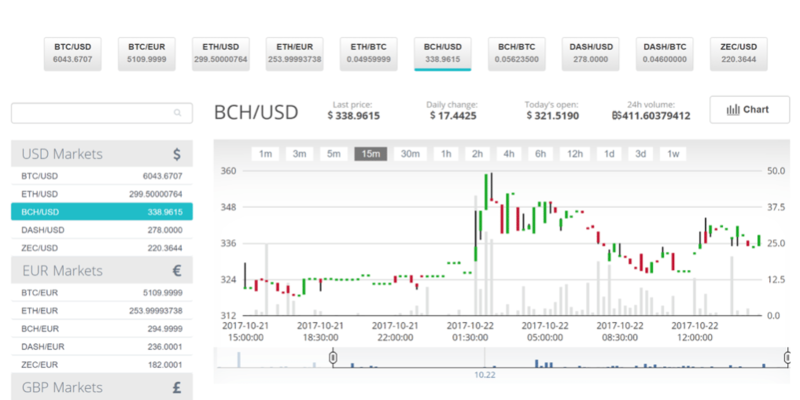 All available exchanges can be found on the official Bitcoin Cash website. We do not recommend leaving your funds on the stock exchange. Once you buy Bitcoin Cash, immediately transfer it to your own wallet, where the private keys are under your control. Next, you need to follow the progress of the transaction using the Bitcoin Cash block explorer, and only after receiving three transaction confirmations can we assume that the process has been successfully completed. It is obvious that Bitcoin Cash still did not receive full recognition in a significant part of the crypto-community. The future of Bitcoin is still unclear. Obviously, this is not the last split, and Bitcoin Gold, which appeared in October, has not yet made any notable success.